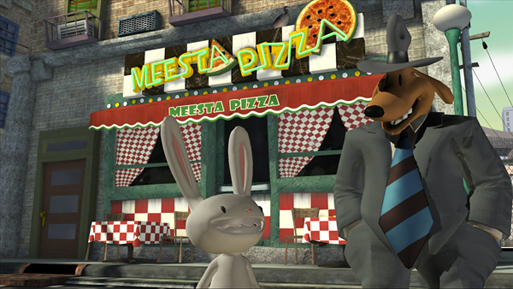 Sam & Max return for a third season of fun with The Devil’s Playhouse, and the first episode (of five) is now available to download from the PlayStation Store. Each month, a new episode will be released each complete with its own story. 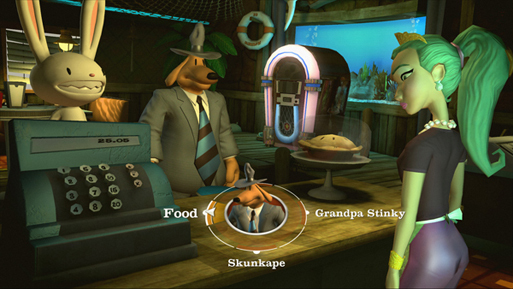 Sam & Max is an adventure game with a ’70s B-Movie feel to it. Despite the game being in the third season, you don’t need to have any knowledge of the duo before jumping right into the game. 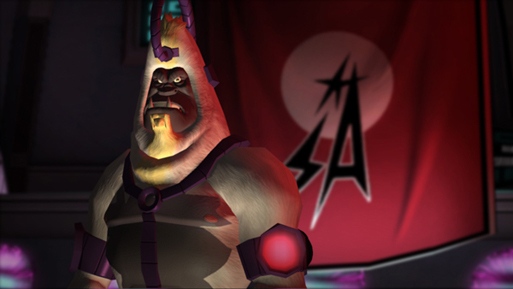 STORY: The first episode starts with a flashforward of the game, showing General Skun-ka’pe, a sort of space gorilla, who has who has captured the anthropomorphic duo and has put them behind bars. The prologue level is a short tutorial into how to play the game, before you are returned to the present. As the two have seen their future, the aim of the first episode is to make sure the future happens as you saw it. Sam is a six-foot dog in a baggy suit sporting a trombone-sized .44 hand-cannon. Max is three feet rabbit with a saw blade grin and the impulsive nature of the average piranha. Together they patrol the sticky streets of a fantastical New York City, righting wrongs, pummeling perps, and ridding the urban landscape of the shifty legions of “self-propelled gutter trash” that litter their streets. 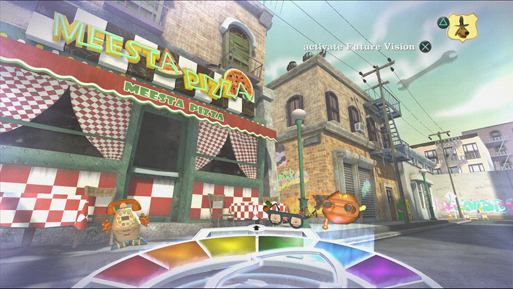 GAMEPLAY: You can play as both Sam or Max and can switch between the two by pressing the button. Max has inherited special powers which play a big role in the game. In the prologue level, Max uses various tools to escape General Skun-ka’pe. One of these powers is teleportation, allowing Max and anything or anyone touching him to transport from telephone to telephone. Another ability to see in the first level is the ability to read people’s minds, which plays a vital role as you progress through the game. As for Sam, he has no special powers but does his bit to help out. As Sam has no pockets, all the items you collect in the game gets stored in Sam’s inventory. You can use an item or give it to someone using the button. Max cannot move around but Sam can using the left analogue stick. Sam also carried a notebook to keep track of characters, Max’s powers and the plot. This makes it easier for you to return to the game after a break and get caught up with everything that has been happening. If you get stuck on a puzzle or clue, there is a five-layer hint system to encourage and “gently” guide you in the right direction. A frustration meter is built in so that the game will track how long you’ve been working on a puzzle and how many things you’ve clicked on. GRAPHICS: The graphics are crisp, and the character models are very interesting. Telltale Games have created many characters for the game, each unique in their own way. The environments are detailed and equally crisp as the rest of the game. However, sometimes we did notice the lip-sync wasn’t matched with the voice acting, but this didn’t spoil the overall experience. SOUND: The voice acting is superb, with some amazing and hilarious one liners. 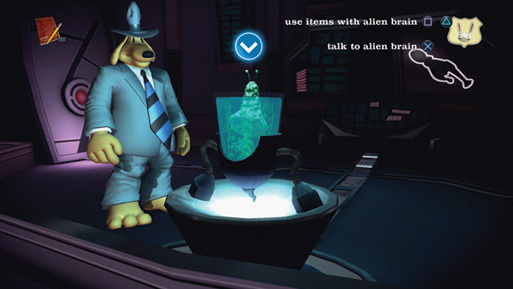 The Sam & Max franchise is known for its comedy and there were a few times where I laughed out loud. The music is good, and fits the old school detective style of the game. It’s weird not having any music in the main menu and when booting up the game, which is a bit weird. LONGEVITY: We’ve only played the first episode so far but you can easily spend a few hours on it. Once all five episodes are out, you can expect to spend over 10 hours playing the complete set. The game features unlockable trophies too, with the first episode containing 13 in total. Some of the trophies are story based but the others may take you a second playthrough to obtain. VERDICT: If The Penal Zone is any indication of the quality of the episodes to come, then we can’t wait to see what else The Devil’s Playhouse has in store. We found the first episode hilarious and equally enjoyable to play. For fans, there is no question to pick this one up, as it gives you three to four hours of fun and traditional Telltale gameplay. For those new to the title, we recommend download the demo before you decide to purchase the complete season. If you like the game, you can purchase all five episodes for £19.99 / €24.99. As each new episode is released, you will be able download them for free after purchasing the first episode.